Country Estates: You can find some really nice country estates along many of the roads in the Ennis area. Some of these will also put some interesting things in their yards in the midst of the wildflowers. 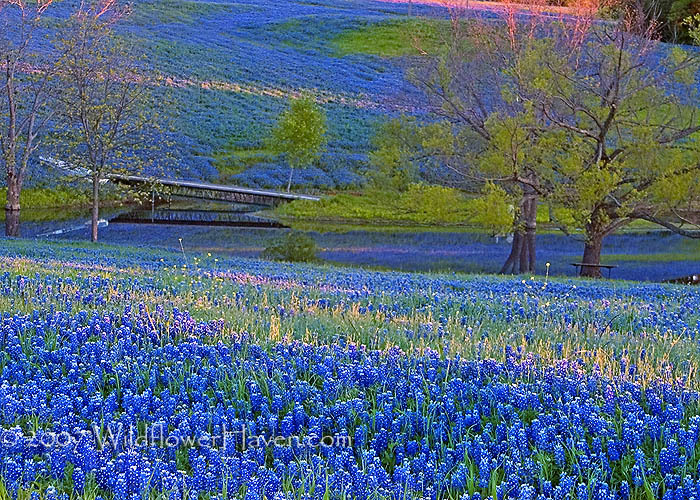 Here is one that at sunset provided an interesting contrast of red color with the bluebonnets. Other interesting structures include, fences, old wooden bridges, dead trees, pumps etc. Check our the free Ennis eBook at http://www.wildflowerhaven.com/ebooks.aspx for suggested routes and route maps for this season.